attrib -h in command prompt. All the above methods failed and now I want to know some other method to find my hidden files.Is there any other way to do so? Please provide a method as soon as possible as it is annoying me too much. Open Run by simply pressing windows + R key. Now Type regsvr32 /i browseui.dll and Press Enter and wait for the confirmation. Now Type regsvr32 /i shell32.dll and again Press Enter and Wait for the confirmation. This will solve your problem.Always use a good Antivirus to prevent this kind of Issues. 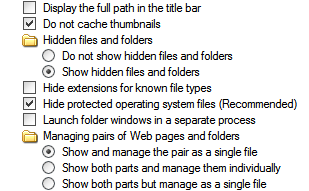 First of all make sure you have enabled show hidden folders in your computers. Now you have used the Attrib-h command but i will advice you to manually enable show hidden files and folders. 1.Click start and then click on control panel. 2.In the control panel window click on Appearance and Themes. 3.In the new interface click on Folder Options. To show protected system files, just uncheck this box and a warning confirmation dialog box will appear. Now you are searching for your hidden files on your windows XP,then you don't worry i am providing the some step by step instructions follow carefully and this is the very easy process given bellow. First of you need to turn on the your PC. After that click on the start menu. In that you have the run option, click on it. In that you need to type the regedit and then ok. In the left pan just click on the "+" sign to expand the list. After that goto this path by expanding the list one bye one that is HKEY_LOCAL_MACHINE\SOFTWARE\Microsoft\Windows\Curr entVersionÂ*\Explorer\Advanced\Folder\Hidden\SHOWA LL and after that you need to look in the right side pan and there is a entry named like checked value. So here you need to double click on it and now change this checked value to 1 and then ok.
By default, the Search companion does not search for hidden or system files. Because of this, you may be unable to find files, even though they exist on the drive. >Click Start, click Search, click All files and folders, and then click More advanced options. >Click to select the Search system folders and Search hidden files and folders check boxes. NOTE: You do not need to configure your computer to show hidden files in the Folder Options dialog box in Windows Explorer to find files with either the hidden or system attributes, but you need to configure your computer not to hide protected operating system files to find files with both the hidden and system attributes. 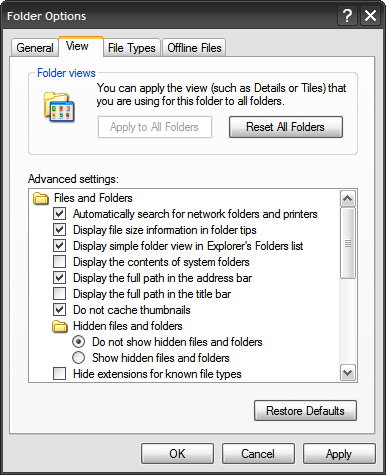 Search Companion shares the Hide protected operating system files option (which hides files with both the system and hidden attributes) with the Folder Options dialog box Windows Explorer. I think you didn't tried this simple method. Select Folder options under Tools tab. Now folder options will be shown. Now you can see the hidden files on your pc. 1.Open START>CONTROL PANEL and double-click on FOLDER OPTIONS. 2.Click on the view tab and then Click the radio button for SHOW HIDDEN FILES AND FOLDERS. If you are unable to find the hidden files . Than you can simply open the folder in which your files were stored. Than on the address bar above type the name of the folder with the disk address. "D:\hidden folder"
This will open your hidden folder..
Once the folder is open you can cut paste the data from the hidden folder to a normal one. But do use a good anti virus to avoid situation like this. Follow these steps to solve your problem. Open any window of your drive. Click on the view option located on the top left position of window (beside file option). Now select the folder option from the list. a new window will open-now click on the view tab. double click on hidden files and folders list. now click on empty box beside the show hidden files and folders option-a green dot will cover the round box. now click on OK option to save changes. there is a entry named.. "Checked value"
This happens many time because of the effect of virus or system setting problems. If it is system setting problem it can be easily rectified by methods suggested by other members. If it is virus attack then it is a big headache. just navigate to the location where u have placed the hidden file. Click Apply & Ok to Save your Preferences. You can do another method, if your system doesn't show folder options. Hidden files are meant to hide files from others. You can enable it to hide your files or disable to see all the files. select view in that folder options window. Select the radio button Show hidden files and folders. Step 3 In the Advanced setting option show the Hidden files and folders option it has 2 option. Step 4 First option “Do not show hidden files and folders” does not show the hidden file and second option "show hidden files and folders” show the all hidden file. Go to my computer >tools>folder options>view>choose show hidden files . Then it will solve your problem. 5)Choose the Show hidden files and folders radio button under the Hidden files and folders category. 6)Click OK at the bottom of the Folder Options window. 7)After clicking on ok You should now be able to view all files and folders. -->Their on top you will find search. -->In that you can search the hidden files by giving file name. -->Go to start button in that also you can find search option. -->just click on that you can search files by giving file name..
see, to get the hidden files and folders in windows Xp firstly you need to make the visible(show). you can do so by the following steps. 1.Go to the control panel. 2.Switch to the classic view if it is in Category view-else keep it. 3.Click on the folder tabs. 4.Click on the view tab & go to the advanced settings. 5.Select Show hidden files & folders option. 6.Now select your desired option & save the changes. This is very simple getting hidden files/folders. Step1: Open any location to explorer. Step2: Click on Tools menu and click on Folder Options. Step3: A Folder options Dialog box appear on screen . if check the radio button " Show hidden files/folders " if not checked. Step4: Refresh the explorer once. step3: go to required location by using command prompt. step4: type this command attrib +h. haply access your hidden files. 2. Type "regedit" and click "Ok". 4. Look at the "CheckedValue" key... This should be a DWORD key. If it isn't, delete the key. 5. Create a new key called "CheckedValue" as a DWORD (hexadecimal) with a value of 1. 6. The "Show hidden files & folders" check box should now work normally. 3)In that you can search the hidden files by giving file name. 4. in that find out .....show hidden files , folders and drivers and select that option. 5:Finally click the radio button "Show hidden files, folders, drives"
6:After that, Click on, apply and followed by OK. If you want to hide follow the same procedure and click radio button, Hide files and folders , drives button! For solving these problem... follow as i say..
Go to Start menu and click on Run or Press ( Windows key+R ). Open command prompt type below commands there. Type regsvr32/i brouseui.dll then press enter and wait for conformation. Type regsvr32/i shell32.dll then press enter and wait for conformation. Next open Windows explorer, click on tools>folder options. Double click on checked value and set it's value 1. Double click on checked value and set it,s value 0. 2.There in the top you can see the option 'Tools'. 3.By clicking on that option a dialog box will open. 4.Then click on the option 'Folder Options'. 5.In that you click on the 'View' tab. 6.There in the view tab you can see the option 'Show hidden files and folders'. 7.Make a check on that and click on 'Apply' and then OK.
That's it by doing as i said you can find hidden files in Windows XP. It is very easy to Show Hidden Files and Folders in Windows OS. First of all, open any Folder in Windows Explorer. Then, click on Tools button from the Menu Bar. Now, choose Folder Options from the drop down menu. Here, choose View Tab from the dialog box. Now, choose the radio button "Show Hidden Files and Folders". By running these two commands the problem will be solved. You just check the "scan for viruses "
<> click to select " Search system folders" and finally "search hidden files and folders "
Now you are searching for your current hidden data on the home windows XP,then you fear not we're giving the many step by step instructions abide by thoroughly in addition to here is the a piece of cake process supplied bellow. Initially you have to change on the your current PC. Soon after that click on first menu. In that there is a perform method, click on it. Inside you need to style the regedit and then ok. Inside the kept container just click on the "+" hint to be expanded the list. And then goto this route through extending this list one ok bye built to be HKEY_LOCAL_MACHINE\SOFTWARE\Microsoft\Windows\Curr entVersionÂ*\Explorer\Advanced\Folder\Hidden\SHOWA LL in addition to following you need to look in the proper facet container and there's a gain access to known as similar to checked out value. Below you have to double click on that and now change this checked out value to help 1 and then ok.
Then click on Organize option..
Then click on Folders and search options..
Now click on View tab.. Your hidden files will be shown..
You are having a trouble to Find Hidden files in windows XP. To show the hidden file you have to follow the steps below . and then chicl on radio option show hidden file , folder and ... option . Now you can seen hidden files into your windows. then select open all control panel items..
then select folder option menu..
mark, or tic, show hidden folders,files and drives..
it surely display hidden folders in your system..